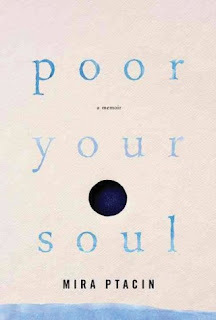 While I’m often a reluctant and infrequent memoir reader, Maine author Mira Ptacin’s memoir, “Poor Your Soul”, is one I would highly recommend. This is a deeply moving personal account of loss and triumph. At twenty-eight, Ptacin found herself unexpectedly pregnant. At first uncertain, she eventually embraces the pregnancy, her new marriage, her future. Sadly, an ultrasound at five months reveals that something is terribly wrong, and Ptacin and her husband must wrestle with choices that all feel unthinkable. Ptacin weaves her own turbulent story with her mother’s story of immigration from Poland and the tragic loss of her son, Ptacin’s brother. Ultimately, this is the story of two women finding strength in the face of tragedy. It is so intimately written, so well-crafted, that it feels like you’ve been invited to a family dinner at Ptacin’s and you get the pleasure of sitting back and listening while stories unfold around you. The stories of these two women come together seamlessly to create a cohesive narrative, but also to create a conversation between writer and reader--an exploration of questions that are sometimes just asked and never answered; a place to pause and reflect on feelings and on events that might be impossible to process in the moment. I sometimes find memoirs overly ambitious, too directive and too self-centered. “Poor Your Soul” is none of those things. Other memoirs I have loved include: “Townie” by Andre Dubus, “When We Were the Kennedys” by Monica Wood, and “The Lost Landscape: A Writer’s Coming of Age” by Joyce Carol Oates. These happen to be three of my favorite writers of fiction as well, so maybe good writing is just good writing. Stop by the library to browse, or join us on Thursday, June 22nd from 10:15-10:45 for our first Calm as a Critter Yoga Class (for children ages five and up). The classes will run through August 17th. For more information, contact the Children’s Room at 892-1908.